The human race could be devastated if aliens were to learn of our existence and venture to Earth, warned British scientist Stephen Hawking on Sunday. But how could extraterrestrials really invade Earth? Aliens have already viciously attacked our spacecraft, savagely kidnapped us, heartlessly conducted experiments on us, and mercilessly aimed their death-rays at us, but of course, all of these crimes have been committed only in novels and movies. Other experts who, like Hawking, have devoted their careers to thoughtful exploration of the possibilities of alien contact say that we don't have anything to fear. "In movies, aliens only come here for two reasons," Seth Shostak, senior astronomer at the Search for Extraterrestrial Intelligence (SETI) told Life's Little Mysteries, SPACE.com's sister publication. "They either come here to find some resource they don't have on their own planet, or they want to use us for some unauthorized breeding experiment." These scenarios play on our most primal human fears of losing the resources we need to survive or not being able to reproduce, Shostak said. NOTE: WE'LL BE DISCUSSING THIS TONIGHT ON LARRY KING LIVE – DO YOU AGREE WITH HAWKING'S BELIEF ABOUT ALIENS? LET US KNOW – WE WANT TO HEAR FROM YOU! We have observatories, large radio installations looking for life outside of our known world, however up today we have no signal announcing that they are coming! Since we are not even able to go to the Mars, a close planet, our days of venturing beyond our sun system is hundreds of years away. We are sending radio signals, but not receiving any, that means either we have the wrong frequencies or those ETs have even less knowledge of getting lost in space. So sleep peacefully, all those UFO reporting are false alarm, if we had visitors they would certainly stop for a scoop of good american icecream. Or to help Mr. Trump to dispose his latest barbie doll. What a way to go, two million miles an hour to the end of the gravy train. As far as an alien race(s) being able to invade our planet and cause havoc,I think if people would just pay attention to what has been said by very credible people from all walks of life and deverse ethinicities and positions on our planet ,I would think that it's safe to say,that we have been invaded many times over centuries of time. What is hard to understand is their agenda.And why they are reluctant to make themselves known to the common public. Even the vatican recognizes the possibilties of life elsewhere in the Universe! a lot of the truth that is out there is being held secret by our governments. And I don't care what anyone else has to say about that! I know that they do know a lot that they are not telling us! We are being kept in the dark. I just have one quetion to that,Why? As far as an alien race(s) being able to invade our planet and cause havoc,I think if people would just pay attention to what has been said by very credible people from all walks of life and diverse elasticities and positions on our planet ,I would think that it's safe to say,that we have been invaded many times over centuries of time. What is hard to understand is their agenda.And why they are reluctant to make themselves known to the common public. Even the Vatican recognizes the possibilities of life elsewhere in the Universe! a lot of the truth that is out there is being held secret by our governments. And I don't care what anyone else has to say about that! I know that they do know a lot that they are not telling us! We are being kept in the dark. I just have one question to that,Why? In short yes. I agree. I am posting a question to put out to your viewers though. I am submitting it because I think it would add to your shows topic/content as well as educate the audience. Question: When we detect intelligent life outside our known world, then what? Will we call an emergency UN Conference? What will we collectively do as a Planet? Observe from a distance or land on the White House lawn? I don't really believe there are 'aliens' among us, however, I have an "open mind" about the whole scenario. My belief is that IF it were TRUE, ...more people would have legitimate PROOF of this happening. Looking forward to your show, as always. Congratulations, Larry, on your great, long-lasting show, that always keeps us "informed." YOU have had some of the most "interesting" interviews I've ever seen. All the best to you, always! I think that the alien races have been involved with this planet for quite some time. If you look at the things that our ancient cultures have left us in the form of paintings, artifacts and written accounts there has to be some influence from another world that inspired these actions. There may be some alien races that do mean us harm but I think most of them are here to help. If they did want to harm us I think they would have done it a long time ago. they wanted to be hostile, we would already be gone! Does Mr.
On July 16, 1945, we announced our level of intelligence to the rest of the Universe by sending a signature that should not have come from a planet, the first atomic bomb blast. That and subsequent "announcements" make it pretty difficult for us to take back our commnication to the galactic community that "We are here". Those electromagnetic radio signatures have travelled up to 65 light years in all directions and as time goes by will continue to spread in an every growing bubble. We should not assume that space travel is all that difficult or impossible, or that other means of physical or remote projection takes huge amounts of resources or energy. 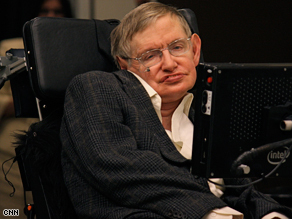 I respect Stephen Hawkings and he is too smart to be ignored. This is a great mental challenge he is giving us, and provides fodder for plenty of debate. Just cross the border and visit LKL...and you too can be an alien. We have millions here, you won't even be noticed. It is rather self-indulgent to even entertain the idea aliens would want to bother with this insignificant little planet! If the Earth was to explode tonight, there would be no impact on our planetary solar system and the 'blip' in the universe would go unnoticed! Steven Hawking is brilliant. He is so right about the nomadic alien colony wanting to take over the Earth, especially the USA. As I write this letter to you, I want you all to know that the nomad colony is sitting behind Saturn right now. I have seen them through my pocket telescope, and have deduced that the rings around Saturn are really the exhaust fumes being caught in Saturn's gravitational pull from their 18,000 cylinder engines. These engines power the aliens' spacecrafts. I want to know what the Obama administration is planning to do about the nomadic alien colony sitting behind Saturn, or do we need to get Jan Brewer involved? These damn illegal aliens are really getting out of control. Oops! I'm sorry ,wait a minute, maybe I should not write this because if Glenn Beck sees it he will link Obama to these aliens behind Saturn and probably report how Mr. Obama is the leader of this alien colony, and by default he should no longer be our president. He will probably accuse Obama and his administration of being like the V TV aliens and say that their policies match up. excuse me but someone should tell Seti Spokesman that Stanton Friedman has made an excellent point that they are probably not using radio signals.........lets get current people!! Your best show so far larry. Unfortunately hawking is far off track on this one. To get world wide support for SETI, all people intersted should be given a chance to be a part of. "What if everyone out there is listening" We must also transmit. Hollywood has created this paranoia of aliens to increase their profits decades. " Domestic or Extraterrestrial, The more intelligent a specie, the friendlier they are". I hope to join Seth shostak one day to be a part of this great project. There are also millions of people, very credible people, lawyers, policemen, doctors, astronauts and many many other would have seen craft that are NOT of this world...far beyond our capabilities. Making right hand turns at 10,000 mph etc. If you folks were to REALLY do any research you would find out a hell of alot more than just asking for simple opinions, DO SOME REAL INVESTIGATING for once in your lives..like your SUPPOSED to do. Instead of simply playing a shell game with peoples thoughts. As Chris A points out (April 30th, 7:45PM) we sent out the signal on July 16th 1945. But the catch is that it took no time at all for acknowledgement because at least one race was already here. Anyone who wishes to understand whether we are being visited need only look at our nuclear weapons history and the activity (yes – secure airspace incursions) at our nuclear weapons bases and any of the other facilities that make up the nuclear weapons infrastructure (development, component suppliers, enriching facilities, plutonium processing facilities, assembly plants, and the many other facilities involved in creating and deploying these weapons). You will find that the incursions have occurred since the early forties at all of the above mentioned locations. Our response to these incursions is also well documented. It is a secret that is really pretty much in plain sight – books have been written on the topic complete with photo copies of the government documents backing up the claims. Don’t forget to look at the other five declared nuclear states – more of the same. If these beings were here to "take over", it would have happened long ago. If they were here to take our resources, it would have happened long ago. We are at a point where realizing the existence of these outside races is necessary. Apparently they have been courting our acknowledgement of them for well over sixty years. And as others have pointed out above, likely well back into human history. Just study the Agricultural Revolution that occurred over eight thousand years ago. I do not understand SETI. They absolutely flat out refuse to accept that there may be someone here in our skies already and state that theirs is the only game in town that will answer the question of intelligent life outside of Earth. The evidence is here, right now. Only the governments of the world are keeping it from being common knowledge. They use fear and the facade of authority. Is that what SETI is doing? The evidence is there folks, all you have to do is look it up. Sorry SETI, sorry indeed. Our introduction to the nuclear era changed the rules of the game. As has become apparent, these weapons are not in someone's best interest – that someone is likely us. If it were them, the weapons would have been gone long ago when the numbers were few. It is up to us to acknowledge them AND the folly of the logic behind the nuclear weapons nightmare. No threat. Too far away. We've only been broadcasting for... maybe a century. Nearest star 4.3 light years away. The formula for the volume of a sphere is 4/3 pi R^3. Assuming star density of 1 star per (4/3) pi (4.3 light years)^3, and R_radio_communication ~ 100*c.... and probability of life-supporting planet per star = P. And the probability that intelligent life exists on a life-supporting planet = P_i. Also consider how long human intelligence has existed on Earth. On a cosmic scale, not long. Next, consider evolutionary limitations. How intelligent can a life-form become in a given environment with a limited natural selection filter applied? I think there is a limit. But you people have darkened hearts and only believe the media. The aliens are the Nephilim. You will not believe Jesus, but he will conquer the Satanic New World Order. Accept Jesus, ask forgiveness for your sins and those of your forefathers, and repent. God's creation is infinite. No where does it say we are God's only creation. No where does it say that God's creations can't intermingle – and perhaps help each other out. Before you call these visitors the Nephilim, or demons and connect them to the new world order, a term men have made popular, you should know with certainty what these visitors have been up to. Then make an educated judgement.